Thursday was Team Day at the Berger SWN. The rules called for four shooters. 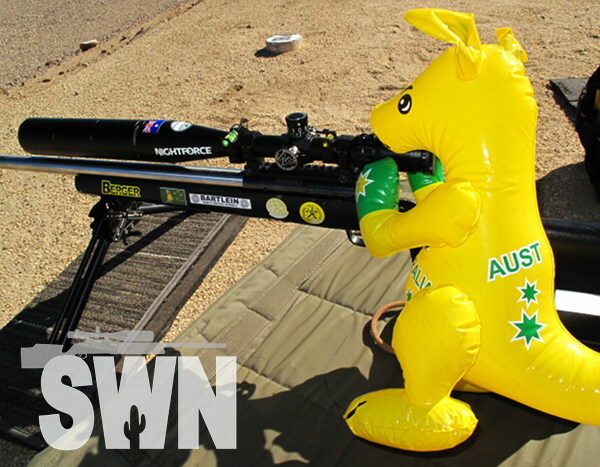 But one Aussie Team had a special mascot shooter to add team spirit. Today, Friday, marks the third day of competition at the Berger Southwest Nationals (SWN), with individual matches on the schedule. 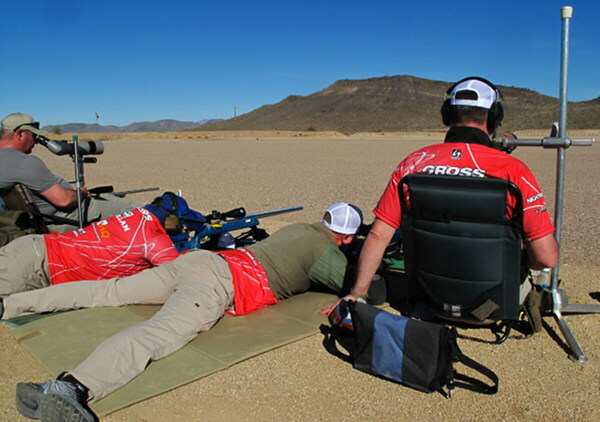 Today’s match will have a Palma format, with shooters competing individually at three yardages: 800, 900, and 1000. This is when it really gets tough — no wind coaches. Each shooter is on his or her own. Yesterday, Thursday, was a Team Day at Ben Avery, with four-person teams shooting at 800, 900, and 1000. We saw some familiar squads on the firing line, such as Team Berger Bullets, The X-Men, and Da Bulls, as well as new squads. 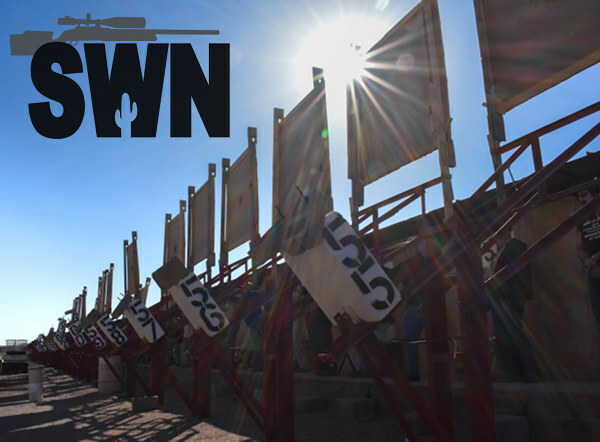 Individual Long-Range Competition starts today, Friday, at the Berger Southwest Nationals. The firing line is full — this match “sold out” early. Photo by Sherri Jo Gallagher. 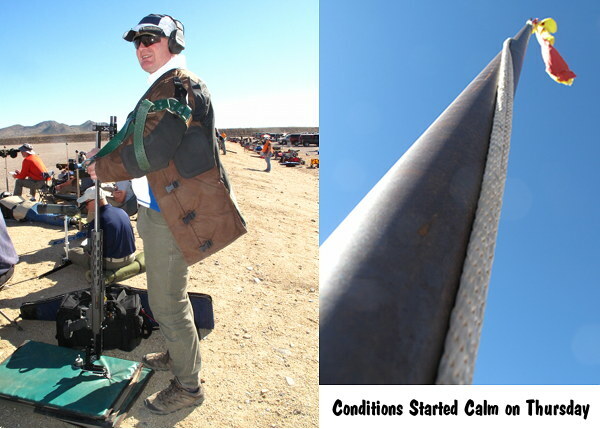 Click Image to see full-screen Panorama of 1000-yard firing line at Ben Avery. Full interim results for Thursday’s Team match are posted on the McMillan Fiberglass Stocks Facebook Page. Thursday’s conditions were much calmer than the Wednesday (when winds were howling in the afternoon). It was very calm in the early morning but then the wind increased gradually during the day, becoming switchy. Many shooters told us the mirage was difficult to read. The sling division was tightly fought, with Scottish HPS Team and U.S. National Mrnak Team tied on points at 1779 at day’s end. The Scots finished first by X-count, 92 to 85. Finishing third was U.S.A. National Hayes Team, 1776-114X. In F-Open, the “Old Gentlemen” of Team Berger lead the way on Thursday, with a score of 1784-92X, followed by Team Lapua/Brux/Borden in second with 1782-101X. 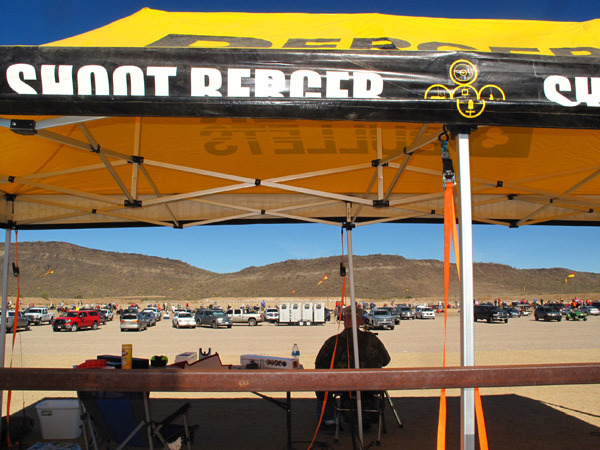 Tied on points in third place, but with fewer Xs, was Team Defiance at 1782-82X. 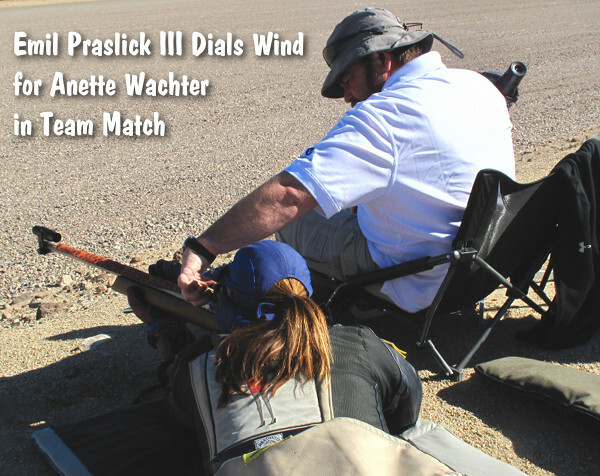 This was a bit of a family affair as Scott Harris coached wife Christine and son Adrian, along with shooters John Moreali and Ben Steinsholdt. Larry Bartholome had top individual score, not dropping a point to finish “clean” at 450-21X. Next best was AccurateShooter’s own Jay Christopherson, with 449-31X. In F-TR, Team “Da Bulls” topped the field with 1762-66X, barely edging second-place Team McMillan which scored 1762-64X. 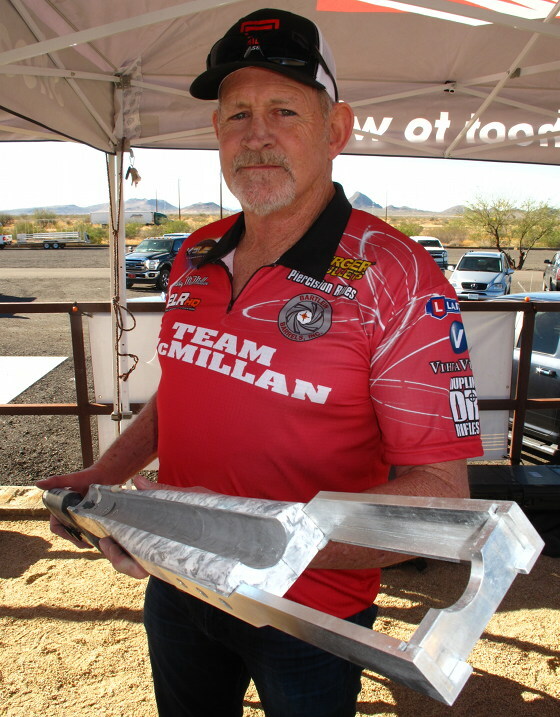 The McMillan team was a powerhouse including current F-TR World Champion Derek Rodgers, and, as coach, former USA F-TR Team Captain Ray Gross. The powerhouse Team McMillan F-TR squads featured serious talent. Left to right here, in their red jerseys, are Captain Paul Phillips, Derek Rodgers, and Coach Ray Gross. One team featured a Father-Daughter Duo, with father Scott coaching Morgan, his talented daughter. Morgan tells us that competitive shooting has unlocked a new world for her. She has traveled to South Africa with her father to shoot in international matches. Shooting at the SWN is a highlight of her year: “I love the warm weather here — It’s snowing back home in New York”. View from the pits at the Mid Tompkins Range at Ben Avery. Photo by Sherri Jo Gallagher. Kelly McMillan showed us a new F-Open competition stock, the Kestros with “Z-Rail”. This features a box-section aluminum extension on the fore-end. This allows a longer “wheelbase” on the stock, as well as a lower center of gravity. Kelly says his company is working may adapting this extension to include an bipod attachment rail. That way you could shoot the same stock in both F-TR and F-Open divisions. SWN VIDEO: Kelly McMillan talks about new McMillan and MCubed (M3) stocks in this video. Kelly plans to host his Taking Stock Radio Show on Friday, February 9, live from the Berger SWN. CLICK HERE for Kelly McMillan’s SWN Radio Show. Some shooters come to to the SW Nationals for the swag (the prize table is amazing). Others come for the sunshine (think warm 80-85° weather). 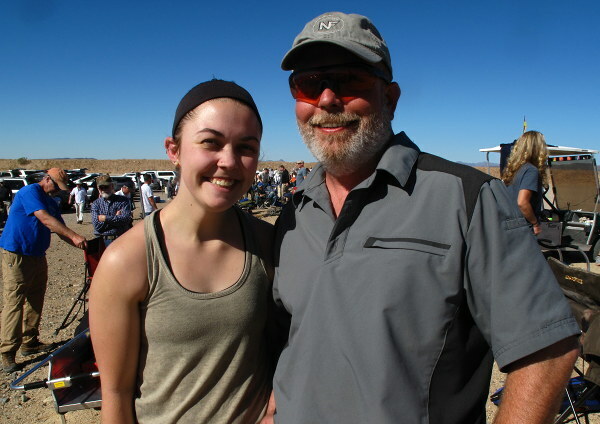 And even more folks come to try out their shiny new toys and to test their skills against the nation’s best shooters. 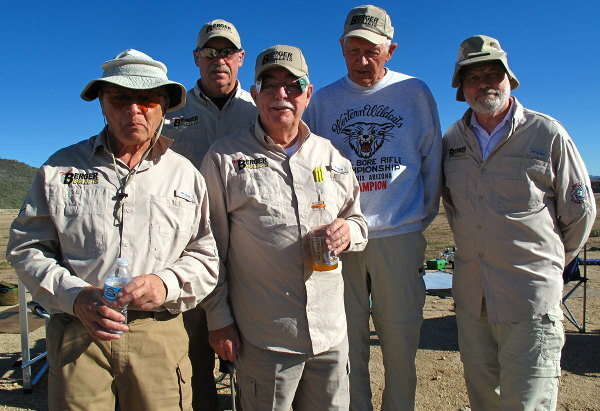 But we’d say the number one reason most folks make the pilgrimage to Ben Avery every year is the camaraderie — the chance to connect with friends, rekindling connections that may go back decades. Fundamentally, then, the Berger SWN is about the people. For many of us, this is the only time of the year when we get a chance to meet fellow shooters from distant corners of the USA (and other nations). Old Guys Rule — Team Berger topped the F-Open field in Thursday Team competition. NOTE: this photo shows 2017 team members. 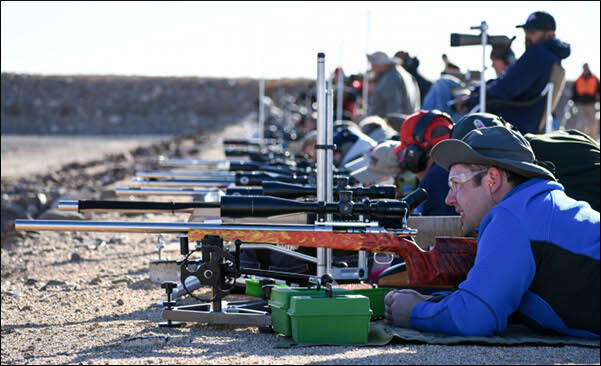 Share the post "Berger Southwest Nationals 2018 — Report from Ben Avery"
Congrats to all the shooters!